Born and raised near Cleveland, Ohio, Diane began her musical journey with the piano at the age of three. 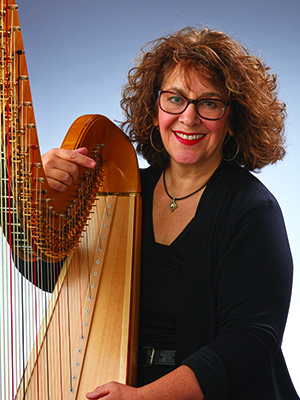 When Diane attended the National Music Camp at Interlochen, Michigan, to study piano and art, she also signed up for a beginning harp class, having been fascinated by a harpist she’d seen on television. She fell in love with the instrument and began working with the Cleveland Orchestra's renowned harpist, Alice Chalifoux. Participation in various summer music festivals, including Tanglewood, supplemented her studies at Oberlin Conservatory of Music, where she earned her degree in Harp Performance. Diane's two outstanding harps were both made by Lyon & Healy in Chicago. The 1980 instrument, a “Salzedo Model,” has an Art Moderne profile. Her 2014 harp, a “Style 30,” is a sleek, contemporary design with a walnut finish. Outside of music, Diane is enjoying the empty nest, as her twins have gone off to college. She loves her book group and her movie group. Art, cooking and gardening are ongoing hobbies. With greater freedom in her life, she hopes to find inspiration and enrichment in travel as time goes by. "Preparing harp music for performance is like solving a complex puzzle. The music presents a set of problems and each one needs to be addressed. I make a decision about which finger will play which string, and once that decision is made, I do it the same way every time...unless I come up with a better idea!"